A dental bridge is used to replace a missing tooth or teeth. It is used to “bridge” the gap between teeth by suspending a false tooth between two strong teeth. A missing tooth can potentially cause shifting of the teeth surrounding the gap and potentially loss of the tooth above the missing space. With changes to your bite occurring, the shape of your face may also start to change. it may distort your jaw alignment or cause speech impairments if the tooth or teeth are missing towards the front of your mouth. Dental bridges are an option in maintaining the harmony and function between your teeth and mouth. 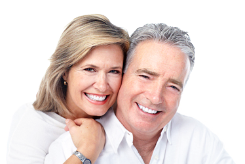 Compared to the gold standard option of a dental implant, a bridge is the more affordable option, but it can come at the cost of healthy teeth. Traditional fixed bridge - This is the most common type of dental bridge, in which porcelain crowns are placed over the two surrounding teeth and used as anchors to hold the false tooth in place. The false tooth is usually made of either porcelain fused to metal or strong ceramics. A minimum of two visits are required for placing a dental bridge. At the first visit, three important steps are completed. Firstly, the surrounding teeth are prepared to be fitted with a crown. This may include reshaping the tooth so that the crown can fit over it. Secondly, an impression is taken of your teeth which will be sent to a laboratory to prepare the bridge and crown. Finally, the dentist fits your teeth with a temporary bridge to protect them while the bridge is prepared at the laboratory.